As the chaplain for the Military Police Corps Regiment and the U.S. Army Mlitary Police School, I’m involved in a lot of MP events throughout the year. Many of these events happen in one week of September during the Military Police Corps Regimental Anniversary week at Fort Leonard Wood, Missouri. This year, they celebrated 72 years as a permanent corps of the U.S. Army. I previously shared in my blog the Memorial Message which I presented at the Memorial Tribute for the fallen MP Soldiers from the past 12 months. Today, I would like to share a brief reflection of the week with what the MPs can teach all of us in respect to our place in the larger force, our remembering the families of fallen Soldiers and our attitude toward those who have died in combat. It is a bit brief due to the space limitations of the post newspaper in which it was published, but the lessons we can learn are easily identified. The Military Police Corps Regiment just celebrated its 72nd anniversary. 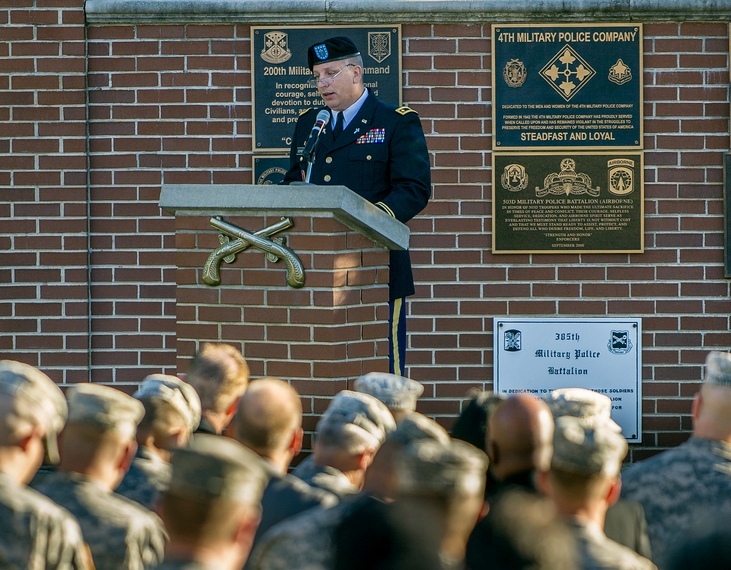 The week was full of events ranging from the fun-filled Regimental Golf Tournament, the celebrative Hall of Fame Induction to the solemn Memorial Tribute. At least for MPs, it was a week to remember. It all began with a Gold Star Family Reception where members of the command group were able to meet with the Families of the MPs who had fallen in combat over the past year. This intimate reception provided an opportunity to reach out to the Family members, offering condolences while encouraging and supporting them in this difficult time. At the Memorial Tribute, the next day, we honored our fallen and memorialized them with a sacred ceremony and the placing of memorial bricks in the walkway of the MP Memorial Grove. These bricks will serve as reminders of the sacrifice made by countless MP Soldiers over the years. All through the week, we saw reminders of the excellent work done by members of the Military Police Corps around the world in both garrison and contingency operations. We remembered the various MP brigades and groups as we carried their colors in the run and prominently displayed their colors at the ceremonies and events. We remembered the individual MP Soldiers as we presented and recognized their colors. The Military Police Corps Regiment has set a great example for all of us to follow, even in the day-to-day hustle and bustle of our busy lives. We need to remember that we are just one small part of a much larger force serving professionally in locations around the world, many in difficult situations and dangerous areas. We also must remember to continue to encourage and support the Families of those who have lost loved ones in battle. We need to be there for them, reach out to them, and pray for them. Finally, we should honor, in our lives lived faithfully, those service members who have given their lives in our defense, remembering that the sacrifice of these Soldiers, Sailors, Airmen and Marines is what makes our freedom possible; living the admonition of St. Paul when he said, “Share in suffering as a good Soldier of Christ Jesus” (2 Timothy 2:3, ESV). This article on the Guidon website can be found here. My previous post about the MP Regimental Week Memorial Tribute can be found here.